The search for survivors from a migrant boat that sank off Libya has been called off with more than 230 people presumed dead, an official has said. 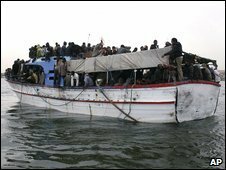 Michele Bombassei, a spokesman for the International Organization for Migration (IOM), also said about 100 bodies had been recovered. Twenty-one migrants were rescued from the boat, which sank early on Sunday. The survivors said it had capsized because of bad weather and people panicking when the boat began to leak. Another boat carrying 357 people was rescued by Italian authorities and towed back to the Libyan capital, Tripoli. The boats were on the route used by smugglers to bring mainly African migrants illegally from Libya to Italy. More than 31,000 people attempted the perilous crossing last year, a sharp increase from 2007. The journey is often made in ill-equipped, overcrowded boats, and many would-be migrants die. The boat that sank on Sunday capsized about 15km (9 miles) west of Tripoli. "Unfortunately we have been told that the search operation has been stopped," Mr Bombassei told the BBC. Survivors said the smuggler, an Egyptian, was among those who drowned. Mr Bombassei, who visited the survivors at a centre near Tripoli on Wednesday, said the amount they were charged for making the journey depended on the nationality of the migrant. "There were some guys who said they paid the equivalent of 300 euros (£270) and others who paid 1,000 [euros]," he told the BBC. "The smugglers want to make as much as they can so they are very flexible." Some survivors the capsized and rescued boats were quoted as saying they had paid even more. Many of those rescued from the boat that sank have kidney problems after drinking large quantities of sea water, the IOM said. Italy is to start joint sea patrols with Libya aimed at stemming the influx of migrants in May. But the patrols have long been delayed for political reasons, including negotiations over compensation demanded by Tripoli for Italy's colonisation of Libya.